Unlike other infections, meningitis can kill you in just four hours. Recognizing the symptoms of meningitis is essential in preventing complications and deaths arising from this infection. 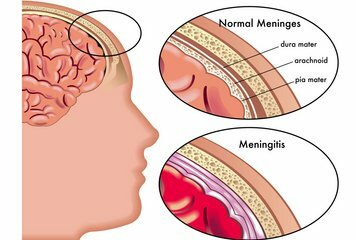 Meningitis is the infection that characterized by the swelling of the delicate protective tissues of the brain and spinal cord. It can develop along with septicemia (severe blood infection) and can kill within several hours. A vaccine is available for some strains, but not for all strains of meningitis. Meningitis can lead to debilitating complications that can be life-changing. Worst, it can lead to death if not treated immediately. Early recognition of the signs and symptoms of meningitis is essential to prevent these unwanted adverse effects. Every year, over 3,000 individuals suffer from various strains of meningitis. One in every 10 patients dies due to this disease, while 2 in every 10 suffer from life-altering complications that range from paralysis to deafness to brain damage. Meningitis can either be caused by bacteria or virus, but can also be caused by fungal infections. It can be contracted from other infected persons, but in some cases tend to be self-infected. Meningitis can develop after a head injury. Although viral meningitis results in unpleasant symptoms, they are not usually life threatening, with patients often recovering fully. On the other hand, bacterial meningitis can lead to serious symptoms and tend to be more fatal. It can be caused by different types of bacteria, with meningococcal bacteria as the most common. Unfortunately, there is still no vaccine developed for this strain. During its early stages, meningitis and septicemia can be difficult to recognize. There is no specific set of symptoms. Usually, the patient develops fever that is accompanied by severe headache, vomiting, feeling unwell, and cold hands and feet. In most cases, the patient develops a rash. The patient may develop rash even if he/she does not feel unwell. If the rash does not disappear when pressure is applied to it, meningitis may be suspected. Have the person seek medical attention right away or call the local emergency medical services. However, even if the patient does not develop rash but displays other symptoms, you should consider it to be meningitis. Seek medical advice right away. For young children and babies, meningitis can cause symptoms that include refusing to feed or eat, increased irritability, stiffness of body, jerky body movements, inability to stand up, and floppy muscles. Babies may also display characteristic high pitched cry and bulging or tense fontanelle (soft spot on the head).